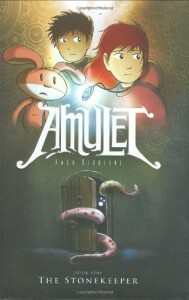 I read the book called " Amulet '' . In the beginning of the book this girl named Emily her Dad and her Mom are in a car. They was on there way to pick up Emily brother Nevin. On there way there the car flip over and almost fell off a clift. They had to live their dad to dead. In the middle Emily goes to her grandpa house and finds a amulet that used to be her grandpa amulet. Then a monster come and takes Emily's and Nevin's mom they was looking for her. when they was looking for her they found her grandpa and asked for help. So her grandpa send his helpers to help and find her. At the ends they found their mom . Then they had another problem with monster so their house turn in to a robot and that's it for the first book. I mean i do not know how it finds for my mom to be lost and not being able to find her but I know it must be hard. This text connects to the text ''Bone'' because in that story the main person lost his family and it took a long time to find them. Finally this text connects to the because people around the world lost the ones they loved and that hurt them a lot. I would recommend. This book to someone that like action and adventure. I would because people like story that maybe there can relate to in someway. So that's why I would recommend this book.